If you are experiencing drainage issues in your Oklahoma home, let Foundation Repair Services install a proper drainage system. Addressing a drainage issue before it becomes a major problem can prevent basement flooding, water leaks and foundation problems. We offer a combination of gutter downspout drains, surface water collection and subsurface water collection systems to control water problems. The products we use for surface drainage and made by Earth Contact Products (ECP), the best products for waterproofing in the industry. When you have standing water in and around your foundation it can enter your basement through any opening, or crack it can find. Standing water can also cause foundation problems. By installing a drainage system, you can keep the water from pooling in your yard and around your home. Don't let water become a problem around your home every time it rains. The experts at Foundation Repair Services offer efficient surface drainage and water collection solutions in Oklahoma and NW Arkansas. We use ECP catch basins and grates to protect property against water damage caused by excess rainwater of irrigation. These catch basins are designed as a collection point for water runoff. Whether installed under downspouts or in planted areas, catch basins collect water and then a drain pipe redirects the water away from the home. The grates are designed to filter out leaves, sticks and debris that can clog the drain pipe. The grate also prevents pipes from cracking in the winter. Another part of our surface drainage system is a strip drain. These strip drains are prefabricated drains that consist of a high-profile, perforated, three-dimensional core that is wrapped with a filter fabric. 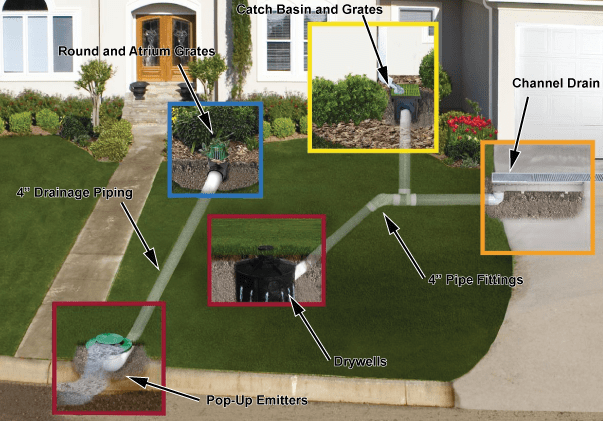 Pop-up emitters provide a cost-effective downspout and sump pump discharge away from foundations. They are designed to rise above grade when water is present and they retrace to allow for mowing. This simple system will provide years of maintenance free use while protecting your basement walls from the hydrostatic pressure caused by excessive water in the soil. By capturing water runoff at the source, dry wells can reduce the increased volume of storm water generated by roofs of homes. Keeping water drained away from your foundation is important. Let the experts at Foundation Repair Services install a surface drainage system for your home. We have the experience and use the best products available. We serve Muskogee, OK and the surrounding areas including NW Arkansas.